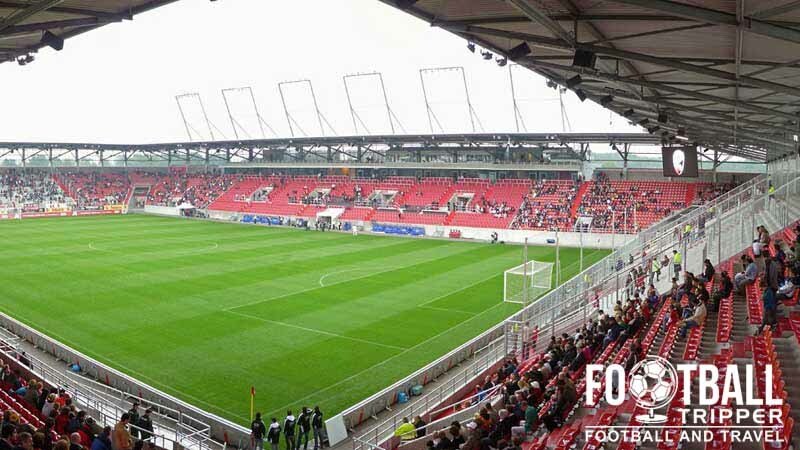 Audi Sportpark is a 2010 built stadium located in the south-eastern city of Ingolstadt, Bavaria. 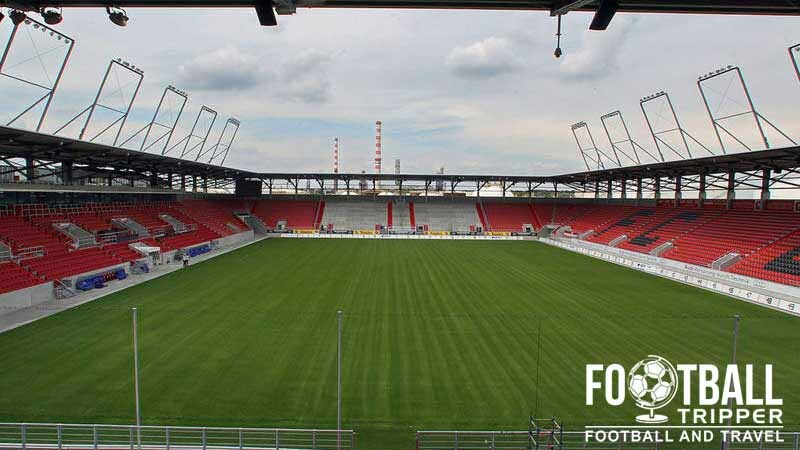 Constructed at a cost of 20 million Euros, the 15,000 capacity ground certainly looks like a bargain, and is home to the 2004 founded club FC Ingolstadt 04. When ESV Ingolstadt and MTV Ingolstadt decided to merge in 2004, discussion regarding which stadium the newly formed team would make their home was inevitable. 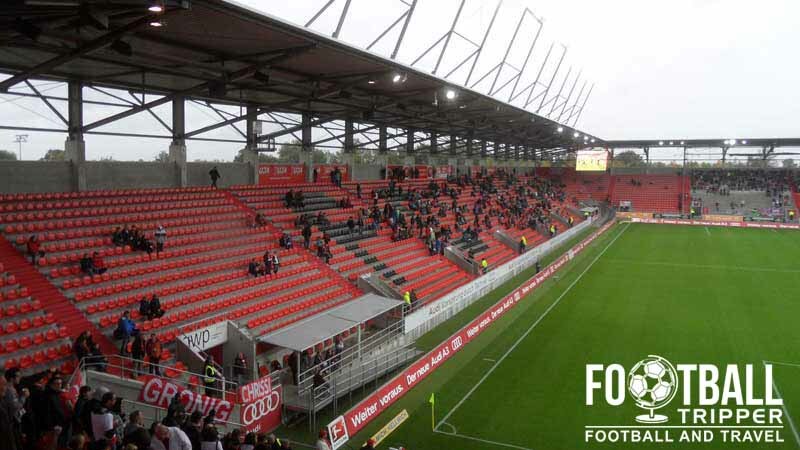 Originally it was decided at FC Ingolstadt 04 would move into MTV’s Bezirkssportanlage Mitte, however when the team reached Bundesliga 2 in 2009 they moved into the rebuilt Tuja Stadion which belonged to ESV. 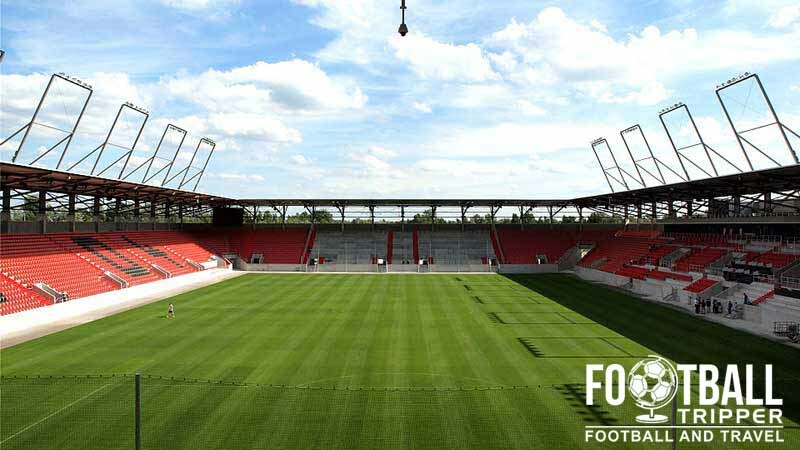 DFB regulations permitted FC Ingolstadt to play at Tuja for a maximum of two seasons before they would have to either renovate the stadium to comply with the league’s stadium requirements, or construct a new stadium. As both stadiums dated back to the 20th century, and renovation work was regarded as an uphill battle, the option build a new stadium won out. After a minor dispute between the site’s former owners Bayernoil and the council regarding levels of contamination, and intense an intense planning process, construction began on 22nd May 2009 with a ground-breaking ceremony. Although there was a slight delay due to a particularly harsh winter, the stadium was built within the expected time line. Capable of seating 9,000 fans and accommodating 6,000 more in the terraces, the stadium easily satisfied the stadium requirement of the second division. AudiPark is designed with expansion in mind, and can be expanded across two further stages which will increase the capacity to 22,000, followed by 30,000 should a larger stadium ever be needed. The newly built AudiPark was inaugurated on 24th July 1010 with a mini-tournament which featured the home side, Vfl Wolfsburg and FC Augsburg. It has since hosed several matches of the German National youth sides Under 21s sides, and the Women’s team including a warm-up match against North Korea for the 2011 World Cup in Germany. Audi Sportpark is comprised of four stands: North, East, South and West. 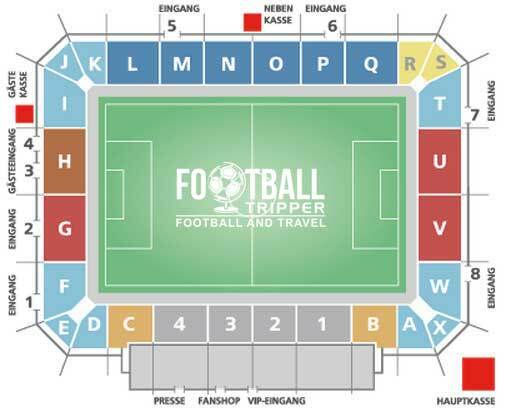 On matchdays there are free buses laid on from Hauptbanhof (the main train station).